Chelsea will reportedly seek to pursue Edinson Cavani from Paris Saint-Germain, should Eden Hazard make the move to Real Madrid in the summer. Chelsea preparing £50m bid for Ligue 1 striker? Chelsea are reportedly planning an ambitious approach to sign Edinson Cavani from Paris Saint-Germain in order to solve their crisis in the striking department this season. Former Real Madrid manager Zinedine Zidane has reportedly drawn up a list of transfer targets, should he be appointed as the next Manchester United head coach. Chelsea have reportedly failed with an opening bid to sign Edinson Cavani from Paris Saint-Germain during the ongoing transfer window. Uruguay could find themselves without both Luis Suarez and Edinson Cavani for Friday's World Cup quarter-final against France. Paris Saint-Germain are reportedly weighing up a big-money move for Liverpool's Mohamed Salah as they seek to enhance their chances of competing in Europe next term. Manchester United and Chelsea have been credited with an interest in signing Paris Saint-Germain striker Edinson Cavani at the end of the campaign. Chelsea striker on Paris Saint-Germain radar? Chelsea striker Alvaro Morata could reportedly emerge as a transfer target for Paris Saint-Germain at the end of the current campaign. The Spain international has endured mixed fortunes at Stamford Bridge this term with injuries hampering his progress. Tottenham Hotspur have reportedly joined the likes of Arsenal and Manchester United in the pursuit of Paris Saint-Germain winger Lucas Moura. Who could move where in the January transfer window? In a few weeks, the winter transfer season opens and there are many clubs looking to strengthen with new players. Paris Saint-Germain have reportedly earmarked Chelsea striker Alvaro Morata as a potential replacement for Edinson Cavani at the end of the campaign. 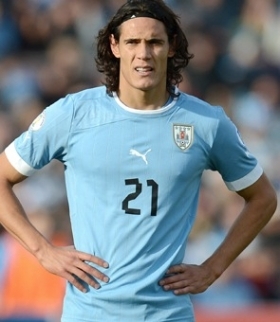 Pars Saint-Germain striker Edinson Cavani is reportedly holding out for a future move to Manchester City. Pep Guardiola's side have made a strong start to their top-flight campaign, and they are presently at the top of the league standings. Real Madrid are reportedly weighing up the option of signing Paris Saint-Germain striker Edinson Cavani. The European champions are on the search for a new marksman in their ranks, and this has recently linked them with a club-record move for Tottenham Hotspur's Harry Kane. Chelsea favourites to sign PSG star? Premier League holders Chelsea are reportedly leading the pursuit of unsettled Paris Saint-Germain striker Edinson Cavani. The Uruguay international was involved in an early spat with Neymar during his side's 2-0 victory over Lyon after they argued over who would take the penalty. Paris Saint-Germain are reportedly ahead of Manchester City in the queue to sign Arsenal contract rebel Alexis Sanchez next year. The Chile international is certain to leave the north London giants when his contract expires next summer. Chelsea and Everton are reportedly keeping tabs on Edinson Cavani following his recent argument with Paris Saint-Germain teammate Neymar on the playing field. Former Arsenal and Liverpool target Julian Draxler is reportedly deemed surplus to requirements at Paris Saint-Germain, just seven months after his arrival from Wolfsburg. Paris Saint-Germain are set to extend their spending spree for the summer with a mega-money move for Arsenal forward Alexis Sanchez.